I like Cracked. You probably do too. But like that old adage that every newspaper story is true except for the ones for which you happen to have firsthand knowledge, I found their recent article on 6 Real Planets That Put Science Fiction To Shame to be . . . lacking. Not lacking in funny, or facts, but lacking in my favorite planets, and some of the weirdest specimens the universe has yet to offer up. So, without further ado, here are 6 more real planets (plus a bonus) that any sci-fi editor would have rejected as “too out there” just a few decades ago. 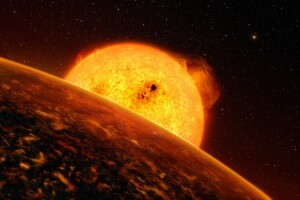 The planet GJ1214b has been the subject of much scientific debate regarding the composition of its atmosphere. GJ1214b is one of the few planets for which we’ve carried out transmission spectroscopy, a technique that measures a planet’s transit curve – the dip in starlight caused by the planet eclipsing its parent star – at various wavelengths. As the planet’s atmosphere absorbs more or less light at each wavelength, the planet will appear effectively larger or smaller, changing the transit curve just slightly. This technique, in theory, should allow us to determine what its atmosphere is made of, and indeed we can see that GJ1214b has an atmosphere of . . . something. Unfortunately, transmission spectroscopy is difficult, and we don’t have enough data yet to determine definitively whether it has a thick atmosphere of water vapor, a hydrogen-helium atmosphere, or a layer of high-level clouds. The overall density of the planet suggests that it either has a rocky core and a large hydrogen-helium atmosphere, or a nearly pure water composition. 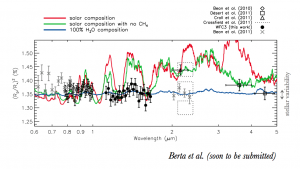 However, recent work by Berta et al. lends weight to the water model, suggesting that the atmosphere is small and close to the planet and must be rich in dense vapors like water, rather than thin and puffed up and made of light gases like hydrogen. If it’s confirmed, it’s not like Earth, though – GJ1214b’s atmosphere would be superheated steam, unlike our own planet’s balmy nitrogen-oxygen mix. And if the thick water atmosphere is confirmed, the overall density of GJ1214b suggests it’s not just the atmosphere – the entire planet could be made of water. Unlike Earth, with its crunchy shell of oceans and land floating on a sea of lava around a chewy iron core, GJ1214b would be water all the way down – an enormous water droplet 2.7 times the radius of Earth orbiting around a star. The outer layers would be superheated into steam, but as you descended through it the steam would condense into liquid, and then solid ice compacted by pressure, like the universe’s weirdest snowball. One of the most iconic images of the original Star Wars trilogy is Luke Skywalker on his desert farm, gazing off into the distance at the double sunset over Tatooine. 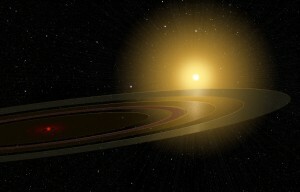 For a long time, though, it was thought that stable planets could never form around a binary star system (two stars). The binary companion would disrupt the formation process or the orbits of planets, and inevitably send them either hurtling out into space or crashing into one of the stars. Stable orbits existed further out, but at the time planetary theorists considered it unlikely that worlds would ever form in those regions. But then we found Kepler-16b. The first world confirmed around a binary system, Kepler-16b is a part-rock, part-gas planet about the size of Saturn that orbits every 229 days around a pair of stars that themselves orbit each other every 41 days. Some authors have even suggested that this could give Kepler-16b the appearance of seasons; since one of the stars is much brighter than the other, the average insolation (amount of sunlight received) at Kepler-16b will vary depending on the period of the binary. And what’s even more interesting, Kepler-16b isn’t alone. Two other planets orbiting binary stars were announced at the Kepler conference, Kepler-34b and Kepler 35b, establishing this as a legitimate class of planets rather than a one-off. 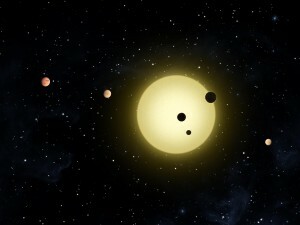 Most of the exoplanet systems you hear about have only one or two planets. That’s not necessarily because they have just one or two planets, but rather because only some of the planets are in the right place for us to detect them. Our current methods aren’t very good at detecting planets that are far from their host stars, or planets that are very small; alien astronomers peering towards the Solar System with our techniques would have a hard time spotting Uranus and Neptune, for example, and might have issues with Saturn or tiny Mercury. Planets like to have a bit of room to spread out, and that means we may only spot a couple of planets out of a system of several. And then there are systems like Kepler-11. Kepler-11 packs six planets into a space smaller than the orbit of Venus in our Solar System; five of them are closer to their sun than Mercury is to ours. The farthest-out has a period of just 118 days; the closest-in whips around its parent star in 10. These aren’t small planets, either: they’re all bigger than Earth, with the smallest clocking in at 1.9 Earth radii and the largest at 4.4. Their densities are smaller than Earth’s, though, suggesting that they’re mostly made of hydrogen, helium, and assorted ices. You can see an awesome movie of the system here. Watch for the double transit, when two separate planets block their star at the same time. HD80606b is a gas giant planet that has the highest eccentricity – the ellipticity of its orbit – of any exoplanet yet discovered, at ( is a circle, is a parabola). Scientists suspect its orbit has been pumped up by Kozai oscillations, a dynamical process that gives a planet alternately high eccentricity and high inclination (orbital angle to the axis of its star’s rotation). Its orbit takes it from a maximum distance from its star of 0.88 AU, comparable to Earth, in through a fifty-day plummet to pass a bare 0.03 AU – about 4.5 million kilometers, or around 12 times the distance between Earth and the Moon – from the surface of its parent star. For reference, the orbit of Mercury is about 0.46 AU. This is the cosmic equivalent of a drive-by, except that the planet gets the worst of it; as it sideswipes the star, models predict that the temperatures at its cloud tops spike from 800 K to 1500 K in just six hours. The heat powers massive supersonic windstorms that scream through the atmosphere of the planet at more than 10,000 miles per hour, racing around the planet from the day side to the night like a tidal wave of superheated gas. For six hours the planet roasts in absurd proximity to its parent star, watching its sun grow to about 30 times the apparent size of ours, before swinging back out into space to cool off for a month or so – and then plunging back inwards to start the whole cycle over again. Saturn has been a boon to the astronomical poster industry, if nothing else. Its gorgeous golden rings have served as a symbol of exotic science fiction locales for decades. But what if there were a planet out there that had a ring system that might span nearly half the distance between the Earth and the Sun? Enter the star 1SWASP J140747.93-394542.6 (quite the telephone number). 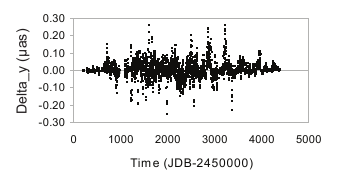 The WASP survey monitors stars looking for variations in their light curves that might be due to transits; they picked up an unusually long and weird-looking one coming from this star in particular. Because of its odd shape and duration, the data processing software didn’t identify it as a transit candidate. But once the survey released their data publicly, a pair of scientists at the University of Rochester spotted it and immediately began to wonder, because the transit had a suspicious similarity to the transits of EE Cephei, a young star surrounded by an optically-thick disk of remnant debris left over from its formation. Sometimes this disk clips in front of EE Cephei, causing strange, long-duration eclipses of the star. Intrigued by the resemblance, Professor Eric Mamajek and his graduate student Mark Pecaut began to fit models and figured out that 1SWASP J140747.93-394542.6 is orbited by a companion, which is itself surrounded by a mighty ring system that might be as large as 0.4 AU – 59.8 million kilometers (for comparison, Saturn’s rings are only 120,700 kilometers in radius). Because 1SWASP J140747.93-394542.6 is a young star, we suspect that these rings are leftover debris from the formation of the star and its companion; so unlike Saturn’s rings, which are mostly fine particles of ice and dust, these rings might be more like an asteroid belt, a big fluffy cloud of dust and gas waiting to accrete onto the companion. Followup observations of starlight passing through the rings will tell us about their density and composition. We aren’t yet sure of the nature of 1SWASP J140747.93-394542.6’s companion; it could be a gas giant or a brown dwarf. It’s hard to tell its radius because of the massive ring system, and a follow-up Doppler observation will be required to establish its mass and hence its identity. Either way, the companion is much, much larger than Earth. However, Mamajek et al. detected at least two distinct gaps in the ring system, zones that had been cleared in the debris field. These gaps can also be seen in Saturn’s rings, and they indicate the presence of moons that have cleared out their orbits. Going by the size of 1SWASP J140747.93-394542.6’s rings, these orbiting bodies – whether they are moons or planets depends on whether the companion is a gas giant or a brown dwarf – may be as large or larger than Earth. Imagine living on one of those moons, surrounded by this massive ring system. Because of their size, the majority of the rings would never pass into shadow; they would illuminate both day and night on one of these worlds. The first mystery to vex the discoverers of exoplanets was the question of “hot Jupiters.” Hot Jupiters are large gas giants that orbit very close to their parent stars, well inside the snow line, the distance from a star where water will freeze. Since gas giants require ice to acquire the large masses that let them accrete so much gas, it was believed that they couldn’t form inside the snow line. So how could there be not one but several gas giants orbiting their stars so closely? Despite what Mass Effect 2 might have you believe, the answer is not “extrasolar capture.” This discrepancy was resolved by theories of disk migration, which predict that planets and proto-planets will move around after their formation. It turns out that planets can migrate large distances towards or away from their stars by interacting with each other and with the disk of gas and dust out of which they are forming, so a gas giant that forms beyond the snow line can end up within spitting distance of its host star. The problem is, many of these migration scenarios involve planets or proto-planets being kicked out of the system entirely. And it’s not just hot Jupiters – some models predict that our own Jupiter might have ejected as many as 2 or 3 similarly-sized planets while the Solar System was forming. So now the question becomes: where do all those planets go? That’s where gravitational microlensing surveys come in. As we covered in this Astrobite, the lensing survey MOA II found 10 events over two years where the lensing mass appeared to be planet-sized, but no companion star was found within 10 AU. For reference, within our solar system both Uranus and Neptune orbit farther out than 10 AU, and the directly-imaged system HR8799 has four planets beyond this limit; so all ten events might simply be planets located at long distances from their parent stars. But it’s also possible that these are planets that were ejected after their formation, and that now wander the galaxy, dark and frozen and alone. New surveys like GPI and SPHERE that can directly image systems, and are therefore more likely to detect planets at long radii, should be able to answer this question. If they detect lots of planets at large radii, the lensing events seen by MOA II were likely caused by these distant planets. But if they don’t . . .
COROT-7b is a small world orbiting close to its parent star. And on COROT-7b, it rains rocks. The planet was first detected by the COROT survey, a space mission that looked for transits. The transit gave us the radius of COROT-7b, and followup radial velocity measurements gave us its mass. This allowed scientists to calculate its density, and they found that it had to be a rocky body with a density twice that of Earth. COROT-7b is only 1.58 times the radius of Earth, and snuggles up very close to its parent star – it races around it in a bare 20 hours. Its proximity gives it a surface temperature that might be as high as 2500 K, high enough to keep the surface permanently molten, and researchers proposed that it be named the first in a class of “lava-ocean planets.” This is hot enough to vaporize heavy elements like silicon, iron, and titanium. Since COROT-7b is so close to its parent star, it’s likely tidally locked, meaning one side experiences permanent day and the other permanent night. When scientists modeled the effects of the difference between surface temperatures, they found that the rocky material of the planet would vaporize on the day side, but not all of it would escape – some would be retained by the planet as a thin atmosphere. And when the clouds of vaporized silicon would drift around to the night side, the frigid temperatures of eternal night would cause the material to condense and fall back to the surface as solid grains and pebbles. Yes. Rocks. From the sky. On a lava planet. So there you go, people. There is a planet in the universe where it literally rains rocks. Stick that in your pipe and smoke it, science fiction; you’ve still got nothing on science fact. And in a time when Congress is seriously considering shutting down the Kepler mission that has brought us more than 1,000 extrasolar planets, it behooves us to remember that we really still have no idea what’s out there. Small correction: eccentricity = 1 is a parabola, not a straight line. Fixed! Man, I don’t know what I was thinking when I wrote that. That’s what I get for writing articles late at night, I suppose. The COSMOS brings new surprises every other day. This article rocks (pun intended)! 😉 Thanks for taking the time and effort to put this together.